Pergolas are great garden features that provide shaded walkways, passageways, and sitting areas. A pergola is a covered framework constructed in a garden or landscape for shade. They can be fitted with lighting for enjoyment and safety after dark. The construction general consists of posts with pillars and cross-beams with a sturdy open structure. While the general population uses the term pergola and arbor interchangeably, the terms originated with more differences. The differences between Pergolas and Arbors is minimal today with the Pergola generally having a flat roof and being larger while the Arbor has a curved roof and is smaller in size. Gazebos are also considered Arbors. Confused yet? Pergolas are built over larger areas to offer more protection than an Arbor. Good examples are covered swimming pools, covered outdoor eating areas, larger lounging areas or covered patios. The Pergola is an outdoor frame structure, usually made from wood or powder coated metal. Normally, they consist of a roof or arch, posts, and latticework to support vines. Pergolas also are used as garden walls and ceilings that don’t block views. There are many choices you can make when it comes to installing a Pergola in your landscape. You will be making decisions on column choices, whether to attach the pergola to a structure or build it freestanding, and what size, material, and color you want. The options are so flexible that you may have difficulty making a decision. You can use Pergolas for just about anything you can imagine and the design is only limited by your imagination. Your new Pergola can be attached to your existing patio, deck, home, outdoor workshop, play areas, and more. For added protection, an outdoor solar screen or canopy can be added, it’s really all up to what you need and want. One of the most popular designs in Arbor’s is the Arbor & Bench. Simple arbor structures are great for defining sections of your landscape. For instance, you may have a backyard patio area where you and your family barbecue or enjoy and outdoor fireplace. A pretty arbor can enhance this area of your landscape. An arbor is a roofed structure within a landscape that provides shelter to some extent. Vines and plants are commonly planted to grow on Arbors. Ivies, vines, roses, and more can be trained to grow a beautiful archway into your garden or yard. Arbors are usually small in size and are positioned at the entrance to walkways or to shelter a garden bench. At Omni Builders, we build all types of pergolas for customers in Southeast Michigan. 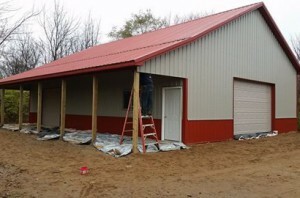 Our professional post frame construction services include all types of out building construction including custom pole barns, sheds, detached garages, decks, porches, lean-tos, gazebos, and more. Our expert Southeast Michigan construction company can help you plan out the design you need and want and then construct it for you. We provide quality services that we are proud of, and we love our work because it makes dreams come true. There’s just nothing like making someone’s property much more functional and beautiful as a reward for hard work. If you would like to learn more about Pergolas or need a Pergola Builder in Southeast Michigan, please call Omni Builders at 517-486-3784 or complete our online request form.